Date of birth unknown. He started his career in Kamigata kodomo shibai at the end of the Edo period, as a disciple of Onoe Tamizô II, wo gave him the name of Onoe Usaburô I. His first notable performance were the roles of Sadaka and Fukashichi in the classic "Imoseyama Onna Teikin", which was staged in the 5th lunar month of 1868 at the Kado no Shibai. He most likely died the 20th of August 1873. He was the master of Onoe Usaburô II. Born the 22nd of the 2nd lunar month of 1860 in the province of Mino. He started as an apprentice for the sumô referee Kimura Shônosuke XIII but he quickly left this world to become a disciple of the Kabuki actor Onoe Usaburô I in 1873, from whom he received the name of Onoe Utaichi. 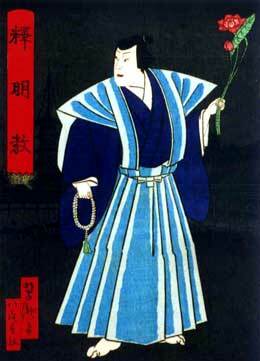 He took the name of Onoe Usaburô II in April 1876. He was a popular tachiyaku in Kamigata, excelling in tachimawari and performing alongside stars like Nakamura Ganjirô I or Bandô Jusaburô III. One of his best roles was Motoemon in the Ôsaka drama "Tengajaya". He died the 16th of January 1928.